For about 150 million years dinosaurs were the dominant animal life on our planet. Then, 65 million years ago, dinosaurs became extinct. That was bad news for the dinosaurs but good news for the small mammals that managed to survive. Since they no longer had to compete for food with the large dinosaurs, the small mammals thrived. Over time, the number and variety of different mammals grew, giving rise to elephants, horses, cattle, cats, dogs, humans, and to other mammals that are on Earth today. One of the puzzles that paleontologists wanted to solve was why dinosaurs existed for millions of years and then became extinct. This chapter tells the story of the search for the answer to that important question, as well as recognizing that such an event could happen again. Paleontologists have reconstructed a history of life on our planet by carefully excavating and dating millions of fossils. Using various methods to date layers of rocks, as described in previous chapters, paleontologists were able to determine when different life forms first evolved, how long they lived and changed over time, and when they finally became extinct. According to Darwin’s theory of evolution, a life form might become extinct if a different life form evolved that was more successful and out-competed the original species for food. Other reasons might be environmental changes, such as radical changes in temperature or rainfall, that made it impossible for some life forms to survive. Especially puzzling was the discovery that at certain periods in history a large number of species died at about the same time. When that occurred the surviving species would over time evolve and proliferate. These new life forms were different from the earlier survivors. The last time a mass extinction occurred was 65 million years ago, when the dinosaurs became extinct, along with 50% to 75% of other species. As a result, the Age of Reptiles ended and the Age of Mammals began. Originally, paleontologists assumed that mass extinctions took place over thousands or even millions of years, possibly because of long-term climate change. Fossil evidence indicates that earlier than 65 million years ago dinosaurs were beginning to decline and that some dinosaur species had already become extinct. There were signs that the climate had begun to cool, so perhaps some dinosaurs were unable to cope and gradually died out. Or maybe small mammals were able to out-compete the dinosaurs for food. Then, in the 1980s, a group of scientists proposed a radical idea: the mass extinction of 65 million years ago was caused by a terrible catastrophe that engulfed our entire planet. According to their theory, a large comet or asteroid struck Earth, causing fires, tidal waves, and huge clouds of dust that blocked out the Sun for a year or more. Plants and animals would have died by the billions, and only a few species would have survived to repopulate the world. Solving the mystery of what actually happened to the dinosaurs and other animals and plants at the end of the Cretaceous period reads like a detective story. Did the extinctions take place over thousands of years, or in a single cataclysm? Let’s start the story with the more conservative view that the extinction took place over thousand years by processes that occur all the time—volcanic eruptions. According to Vincent E. Courtillot, a geophysics professor at the Institute of Physics of the Earth in Paris, France, the extinction of the dinosaurs can be explained by massive volcanic eruptions. In the 1970s scientists became aware of a huge series of lava flows in India, named the Deccan Traps. Deccan means “southern” in Sanskrit, and trap means “stairs” in Swedish and Danish. The name comes from the appearance of the eroded lava flows, which make them look a little like steep stairs. The lava flows cover 10,000 square kilometers, and in some places it is more than two kilometers thick—nearly a quarter the height of Mt. Everest. In recent years paleontologists analyzed layers of rock in between some of the lava flows. 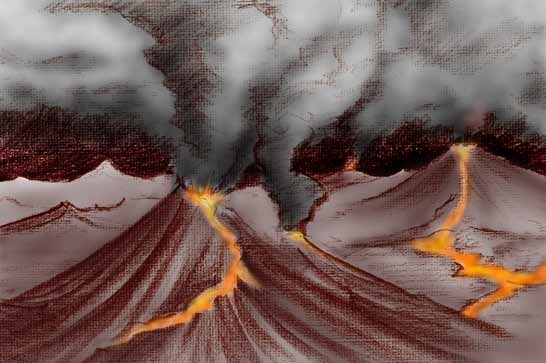 They found that the entire period of volcanic activity spanned about a half million years—including the period of the mass extinction at the end of the Cretaceous. The Deccan Traps are extensive lava flows in India. These layers of lava were deposited during a series of eruptions that occurred over a period of about a half million years. The eruptions spanned the end of the Cretaceous and the beginning of the Tertiary period. Image courtesy of Dr. Keith G. Cox, University of Oxford, Oxford, England. The first effect would have been darkness resulting from large amounts of dust (either impact ejecta or volcanic ash) into the atmosphere. The darkness would have halted photosynthesis, causing food chains to collapse. . . . In support of his theory, Courtillot refers to various studies showing that the extinction of species was gradual, or at least occurred in several steps, over hundreds of thousands of years. One study he cites is by Gerta Keller of Princeton, who found evidence of a first phase of extinction that occurred 300,000 years before the end of the Cretaceous period. She thought the extinction might be due to falling sea levels and global cooling. Volcanic activity could cause the global cooling by ejecting huge clouds of ash into the atmosphere. She also found another extinction event that occurred 50,000 years after the end of the Cretaceous period. 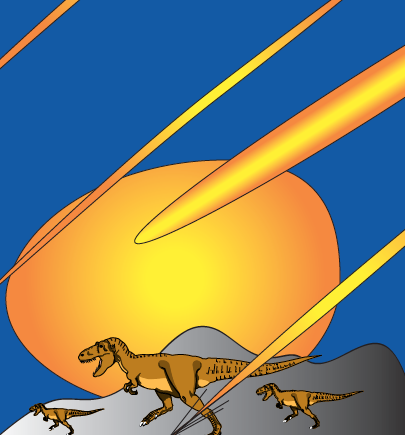 This finding suggests a series of extinction events during and after the Cretaceous, rather than just a single catastrophe. 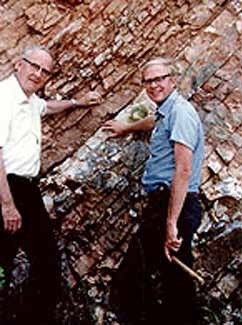 Evidence in support of the extraterrestrial impact theory was also found in rocks, the record of Earth’s history. In many places between rocks of the Cretaceous and Tertiary periods there is a unique thin layer of clay. It was first recognized by geologists in the 1970s. Since then, the layer has been found in many areas of our planet, suggesting that whatever occurred at that time happened all over the world. Just what this unusual clay layer meant, however, took years of painstaking experimentation, study, and much cooperation—and controversy—among scientists. Geologist Walter Alvarez spent summers in the 1970s exploring rock formations near Gubbio, Italy. 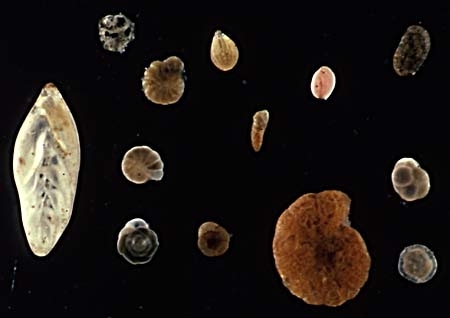 Among other observations, he noted that there were many foraminifera—a form of microfossils, called for short, forams—in the layer of rocks formed during the latter part of the Cretaceous period. Just above the last Cretaceous layer is the thin layer of clay, which has no forams, and above that is the first Tertiary layer, with a few forams. Alvaraz became intrigued with the clay layer. Why were there no forams in this layer? Was it formed quickly? In a few days or months or years? Or was it formed slowly over thousands of years? What did this layer have to do with the mass extinction, if anything? Determining the length of time for the clay bed to form could be a clue in determining the cause of the extinction: a short time would suggest an extraterrestrial event, such as a comet or asteroid, while a long formation period would be in keeping with the idea of gradual change. For help in figuring out how long it took the clay layer to form, Walter Alvarez turned to his father, Luis Alvarez, a Nobel Prize winner in physics and professor of physics at the University of California at Berkeley. Luis Alvarez suggested looking at the concentration of meteorite dust that had accumulated in the clay. Dust from meteorites falls constantly to Earth. Since this fine rain of material from space is very light, we cannot see it, but it can be detected by measuring the concentration of the element iridium. Iridium is common in meteorites, but uncommon in Earth’s crust. If the layer of clay formed over thousands of years, there would be time for the iridium to build up to measurable levels. If the clay took just a few months to form, no iridium would be detected. The difficult, painstaking analysis was initially done by nuclear chemist Frank Asaro, back in Berkeley, and he was later joined by Helen V. Michel, a plutonium chemist. To everyone’s surprise, the clay bed samples contained ten times more iridium than anyone expected, while the layers just above and below the clay bed contained very little. It didn’t make sense that so many more meteoroids would have fallen during this period than before or after. But what if one really huge meteor struck Earth at about that time? The Berkeley group considered the implications of their discovery of the iridium layer. If a large meteorite had struck Earth at that time, it would have created a huge crater. Could evidence of it be found? The answer turned out to be yes, but it took years of concentrated effort and research on the part of many scientists, including geologists, geophysicists, and paleontologists, before the right crater was found. Luis Alvarez and his son, Walter Alvarez, pointing out the K-T bounary in Gubbio, Italy. Photo courtesy of Walter Alvarez. Below, foraminifera. Courtesy of the University of California Museum of Paleontology website. All through the 1980s, efforts were made to find the right crater. Various theories were tested and evidence was gathered by teams of scientists. Finding out what happened to the dinosaurs was like a detective mystery. Eventually the mystery would be solved with enough good clues, but in the absence of compelling evidence the argument continued. Since the first findings at Gubbio, the same clay layer has been described in more than 100 sites around the world. In addition to iridium, the layer contains tiny grains of quartz which had been shocked. Only a great extraterrestrial impact can produce shock waves in rocks. In some sites there were also microtektites—tiny drops of melted rock resembling glass—which are another sign of a cataclysmic event. Despite this evidence in the KT boundary layer, Courtillot noted that although iridium is not common in Earth’s crust, particles of the element have been found in material ejected from volcanoes, which come from the mantle. In other words, volcanic dust can contain iridium. As for the grains of shocked quartz and the soot that were also found in the layer, Courtillot proposed that these too might be caused by volcanic eruptions. Volcanic eruptions can be extremely violent, and perhaps if they are violent and explosive enough, they might produce shocked quartz. Certainly, hot ash and lava have been known to start forest fires, and these could account for the soot. The argument continued until at last the “smoking gun” was found! 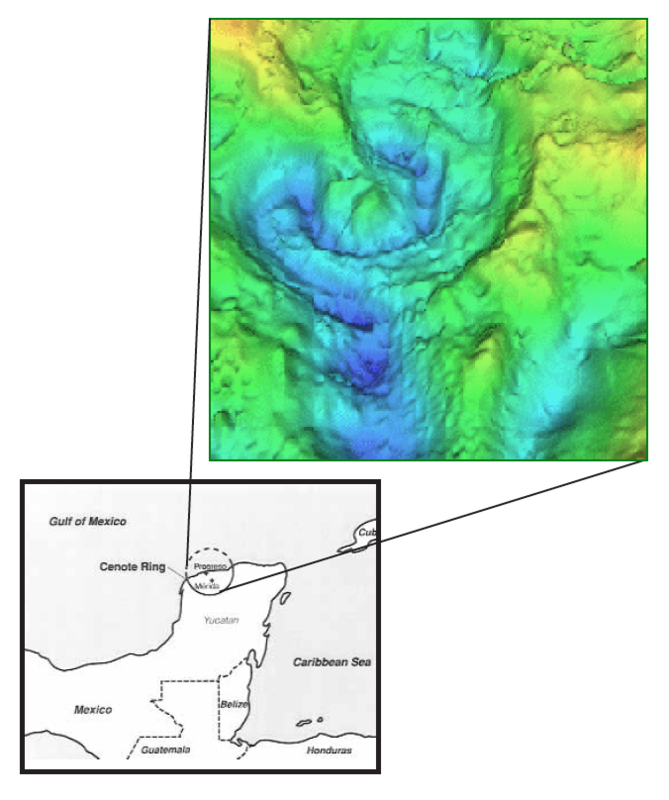 The long-sought crater was discovered, buried underground on the Yucatan Peninsula of Mexico, near a small town called Chicxulub (pronounced Chic-shoo-lube). In 1992, new methods of dating showed that the Chicxulub crater was 64.98 million years old. The crater was created just at the time when the dinosaurs and other species became extinct. The evidence at Chicxulub shows that a large asteroid or comet struck Earth 65 million years ago. The Deccan Traps provide evidence that massive volcanic eruptions occurred at about that time as well. Some scientists have speculated that the impact at Chicxulub triggered volcanic eruptions. Although the volcanism that resulted in the Deccan traps started about 500,000 years before the impact, it is possible that some volcanoes were triggered when the large asteroid or comet struck, thereby adding to the planet-wide destruction. Further support for the impact theory came in 1994, when a large comet struck the planet Jupiter. Astronomers had predicted the collision and were watching the extraordinary event. The comet had come too close to Jupiter and broke into more than twenty fragments because of Jupiter’s strong gravitational pull. As observed by astronomers using ground-based telescopes and space satellites, each of the fragments caused a huge explosion as it impacted the giant planet. Observers reported a spectacular scene with disturbances lasting for months. The map shows the region of the Yucatan Peninsula in Mexico where the Chicxulub crater was discovered. the image about shows differences in gravitational attraction, revealing the crater hidden underground. (Photo courtesy of Virgil L. Sharpton, Department of Geology and Geophysics, University of Alaska, Fairbanks). We cannot know for certain what occurred on Earth 65 million years ago when the Chicxulub object struck, but scientists, using computers, have simulated the probably sequence of events. As described by O. Richard Norton in his book Rocks from Space (1998), the object would have become visible about three hours before impact, appearing like a star, and growing gradually brighter. Fifteen minutes before impact it would have been visible as an irregular shape, growing in size. When the asteroid or comet struck, it would have vaporized as it blasted a crater 100 miles wide and 5 miles deep, releasing energy equivalent to a billion-megaton nuclear bomb. (Or, as Alvarez estimated, equivalent to the energy in all nuclear weapons in all arsenals on Earth.) The blast would have sent a huge plume of material into the atmosphere and into space. Shock waves from the blast would have created enormous tidal waves several thousand feet high, which would have reached hundreds of miles inland, drowning and crushing everything in their paths. The blast would also have created winds of hundreds of miles per hour, and storms would have raged for weeks. Intense heat from the blast and from hot ash raining back on the planet would have started forest fires which could have burned as much as 50% of the planet’s forests. The intense heat and pressure would also have caused chemical reactions in the atmosphere that would create acid rain, killing many of the remaining organisms in a powerful acid bath. Perhaps most devastating of all was the huge cloud consisting of material ejected from the impact site, with the addition of smoke from worldwide forest fires. The cloud would have blocked out sunlight completely for months or possibly years. Temperatures would have dropped precipitously. Deprived of sunlight and frozen, most plants and animals would not have survived. Animals that did survive the initial onslaught would have perished when they found nothing to eat. Only a few of the hardiest organisms that were lucky enough to be in a few protected areas would have survived. We will probably never know for sure if either a large impact or massive volcanism alone caused the death of the dinosaurs. There is evidence of active volcanism at the end of the Cretaceous period and of a powerful asteroid or comet impact precisely between the Cretaceous and Tertiary periods. Either one or both of these events would have had a profound effect on life forms at that time, and as we now know, the majority of species did not survive the event. We also know that it took many thousands of years for a diversity of life forms to repopulate Earth. 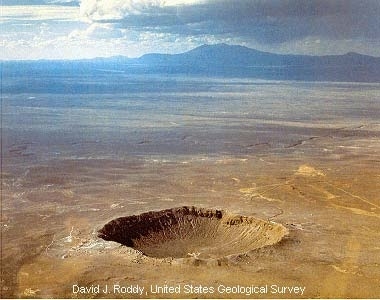 Scientists have located about 150 impact crater sites on our home planet. Two large impact craters, one in Russia that is about 100 kilometers in diameter, and another in Chesapeake Bay, not far from what today is Washington, D.C., coincide with a minor extinction of species at the end of the Eocene period, about 35 million years ago. Even more recently, some time between 50,000 and 20,000 years ago, a large iron meteorite crashed in the Arizona desert. Known as the Barringer Meteor Crater (for the man who filed a claim to the land in 1903), it is the best preserved crater in the world. 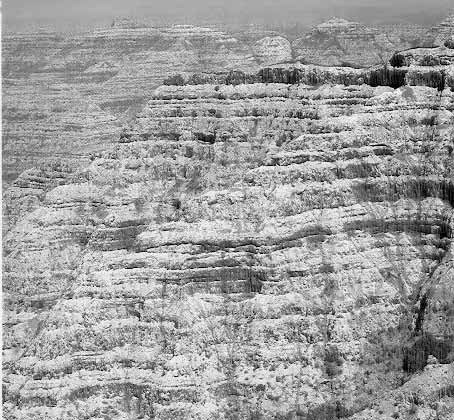 It is about 4,000 feet wide and 750 feet deep. Privately owned, it is a popular tourist attraction. The Barringer Meteor would not have caused world-wide destruction, but it would have devastated life for hundreds, and even thousands of miles of the impact site. Astronomers have begun to track asteroids whose orbits bring them close to Earth. Scientists could then sound a warning and possibly even develop methods of deflecting the asteroid from its path. However, some comets approach the inner solar system on orbits that require hundreds or thousands of years to complete, which would make early warning not possible. Major impact events have happened in the past and are likely to happen again in the future. Luckily, really large impacts do not occur often, and they are unlikely to occur within the lifetime of anyone now on this planet. However, impacts from space continue to be studied to better understand both the forces that have shaped life on Earth and the potential danger of future collisions.